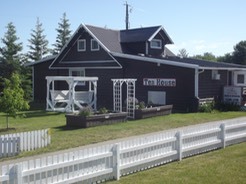 The Pioneer Museum’s Tea House was opened to the public in 2002 and has been serving homemade lunches and deserts every weekend during the summer ever since. The soups, sandwiches and pies have become not only well known, but a favourite in the area. Completely run by our volunteers, the Tea House is the museum’s biggest internal fundraiser and helps provide money to run the operations and programs. The Tea House is open from May to September, Fridays and Saturdays 11:00 am to 3:00 pm, with extra hours during special events. The log cabin that houses our Tea House came from Seba Beach and was donated to the Museum by Mr. Haniuk in 2000. It was originally built in 1922 by Mr. S. Muttart for Dr. Herman Woods, who named the cabin “Tranquility”. After being brought to the museum, it was repaired and the kitchen & back room additions were rebuilt after having to be removed due to rot and damage. It was opened as a teahouse in 2003. In 2007 a small addition was added to the kitchen side to provide a larger food preparation area. It offers homemade lunches and pies and is completely run by volunteers. 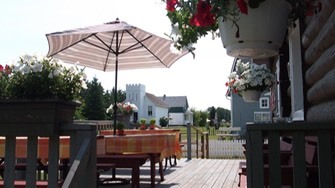 The Tea House is available for rental & catering. Volunteers always welcome and needed.